Group Mark: A single onyx earring of varying size and shape denotes rank in a pattern unknown to outsiders. Group Colors/Livery: They have no official colors, but occasionally, a black handprint has been observed on the wall of a haven, or a mark. Goals: Kill lots of people. Acquire lots of gold. Individual Goals: Among assassins true motives are never spoken. Vendettas, bounties and years of turmoil burden the hearts of all members. Objectives and Objections: The Shades strive to provide exceptional services for exceptional prices. The only rule they have is that the slightest whiff of betrayal summons death from all sides. 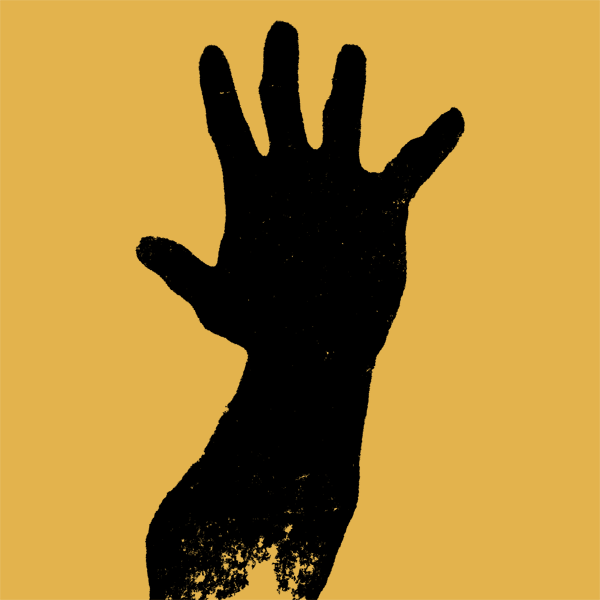 History and Motivation: No handbook, tome, ledger, or any sort of recorded history exists about the Shadow's Hand. Everything the members know has been memorized by each member and passed down through the years, with the exploits of each assassin being committed to memory. 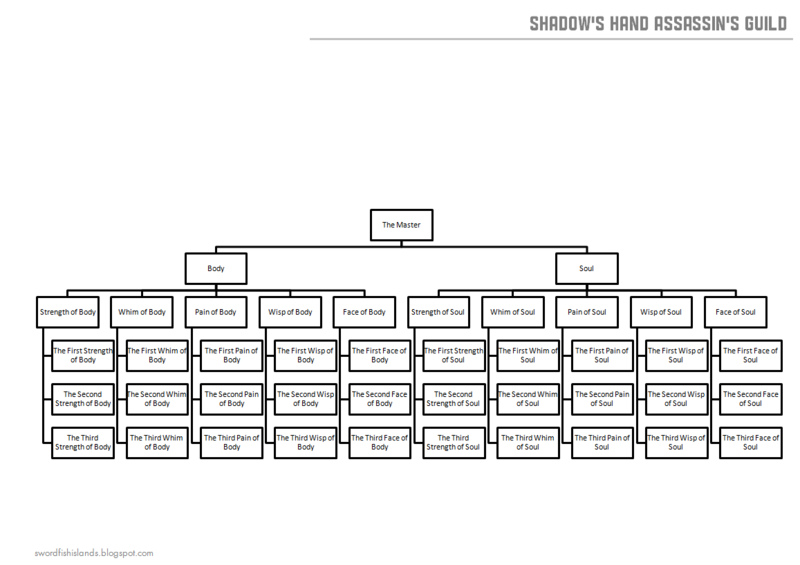 Organization: The Master rules the Shadow's Hand. It is not known if they are male or female, old or young, human or otherwise. The Master could be anywhere, anytime, doing anything. The Master communicates exclusively with The Body and The Soul, each being tasked with different duties. There has never and will never be a paper trail. Chain of Command: The Master rules The Body and The Soul. The Body and The Soul oversee The Strength, Whim, Pain, Wisp and Face. In addition to exceptional talent, The Master also possesses magical and minor psychic ability which has been passed down from Master to Master. New Master's are selected when The Body or the Soul publicly challenges the current Master before a guild assembly. The challenger must successfully kill the Master in seven days, or they will be hunted by the entire guild. Rank and File: Each subset, collectively referred to as The Fingers (Strength, Whim, Pain, Wisp and Face) consist of an elder assassin and three lesser assassins. The Elder is responsible for teaching The Lesser the intricacies of their particular vocation. Here is a list of vocations within Shadow's Hand: The Pain are good with poisons; The Whim are skilled magic users; The Wisp are excellent with subtlety, subterfuge, and disguise; The Face are stealthy and fleet of foot; The Strength are brutal, preferring to either choke, batter, or cause extreme physical pain to their mark before death. Raw Recruits: Those seeking to become Shadows are beneath The Fingers and are associated with the guild indirectly at first. The recruit is put through a series of trials (known as "The Labors" and usually unbeknownst to the recruit) to test their ability to perform the rigors of the job. If the recruit is deemed worthy, he is met by one of The Fingers who will then recite The Oath, and give the recruit a mark. If the mark is retired successfully the recruit is brought before the guild to recite The Oath. There are never more than 33 true members at any given time. Recruits are a dime-a-dozen. The Oath: Initiates to the Shadow's Hand must speak this oath perfectly from memory before a gathering of at least 20 full members of the guild. Should the initiate fumble or hesitate in their delivery, they will meet a swift death at the hands of the witnesses. The full text of The Oath can be found on page one. The initiate speaks each stanza, and the assembled witnesses respond to each stanza in unison with the line "Trust no one". If the recruit can recite The Oath correctly, they are given their earring and welcomed into the ranks. Third Party Relations: While the Shadows may deal with outside groups from time to time, those who are not assassins are not welcome within the ranks. At best they will be rewarded for their aid, but they will never know they are working for a Shade. Resources and Power: Although the current on hand resources of The Shadow's Hand rivals that of a small kingdom, few within the ranks think it is sufficient. Many are convinced that a rival group is preparing to encroach upon their territory at any time. Areas of Operation: Actual Shadows will only ever be found in large cities. Jobs on the frontier settlements or in one horse town are reserved for recruits. Allies: While The Shadows have no partners in their cut-throat business, they do have numerous well-connected long standing clients. These clients provide them with a wealth of social and political resources just waiting to be called in. The fact that they have never needed to call in any of those favors has only strengthened these relationships. Enemies: Enemies of the Shades will usually consist of the local authorities, do-gooders, and adventurers looking to make a name for themselves. While many adventurers have tried to take down The Shadows, none have succeeded. Status Quo: Current operations are running smooth as silk. Everyone knows their place within the ranks, and with the money they pull in, life is good. Those attempting to join will have need to kill someone of some reputation. Those looking to quell their activities will most likely encounter a recruit tailing one of these people of repute, or they'll stumble across the body of a recruit that couldn't remember The Oath.